Nice that the image of the yellow car (and it does appear that it's a single image that's repeated) is occasionally flipped -- some point up, some point down. Makes your eye bounce around the cover more than it normally would. The taxi-cab yellow immediately makes me wonder if taxis are used in a significant amount of car bomb attacks -- although it's the white car that's going boom. 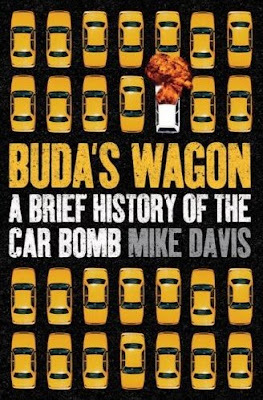 And today's history lesson: Anarchist Mario Buda exploded a horse-drawn wagon in the Financial District in NYC in 1920 -- the world's first car bomb. The little explosion does not convince me, it would be nice to see the explosion move out into the rest of the image. The featured explosion looks kind of like a parachute. This blog is a good thing. Thanks Joseph. That cover would get my attention in a book store. I agree with Eric: the explosion and the theme in common is a much more serious issue. Now it more remind me of someone who forgot their cigarette lighter on in the car and the old wreck is now burning. I also agree on Erics other point: this blog is really good. Thanks.